Mumbai girl Freida Pinto was among a host of celebrities spotted at the GQ Awards at the Royal Opera House in Covent Garden, London. The Slumdog Millionaire actress presented American film producer Harvey Weinstein the Movie Moghal gong. British model Kelly Brook, looking stunning in this pink sheath, presented the Top Comedian gong to Michael McIntyre. The Woman Of The Year Award went to singer Lily Allen. 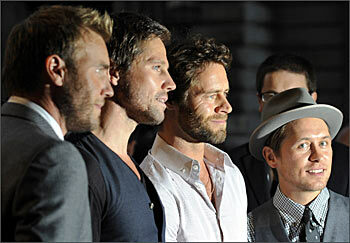 British pop band Take That won the award for Best Band at the GQ Men Of The Year Awards. Gary Barlow, Mark Owen, Howard Donald, and Jason Orange were presented the award by John Lennon's widow, Yoko Ono, who revealed that she was a big fan of the band, reports the Sun. Formula One ace Jenson Button, who arrived at the awards with his girlfriend Jessica Michibata, received the Sportsman Of The Year award. Comedian David Walliams was named Most Stylish Man, while RocknRolla director Guy Ritchie won the filmmaker prize.